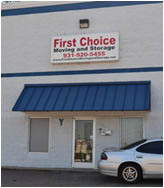 See what previous customers have to say about First Choice Moving and Storage's services. Have your own great experience to share? Submit your testimonial! "Wow! These guys are awesome. Super fast, friendly, considerate. Well worth the very budget friendly cost. Jessica is also awesome and very nice to put up with me pestering her. Highly recommend this company!" "I have had First Choice Moving and Storage move me 2 times so far. They moved us from our home into an apartment while our new home was being built. I am not sure how they got our furniture up the stairs, but they did. It was a very small apartment and very large furniture. They were able to move us from our apartment into our new home and we were very pleased with how quickly they moved us and how courteous they were to us. I would recommend them to everyone." "Usually there is something to improve upon so I only give 4 stars but this company has moved my home and businesses numerous times and are exceptional!" "Absolutely wonderful movers! Cannot say enough about their professionalism and care for your household! 5 star all the way! My ONLY movers! They are recommended in out buyer's pack because they are so wonderful!" "Was a great experience, the 3 men Charles, Gary and Dusty were right on time that morning, all 3 very hard workers and took good care of our furniture, very polite and professional. Highly recommend this Company! Great job guys. Thank you!" What is 158 plus two?